With history of more than ten years, Kingdom mini-household steamer is the best household sprayer in the market today. It is perfect for in-home steamer treatments. 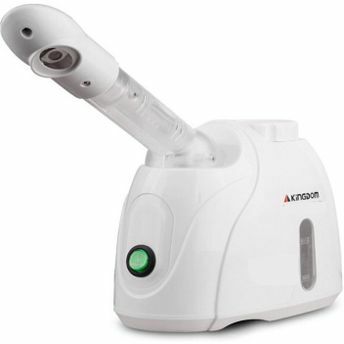 It is easy to use with the simple on-off design.When the steam sprays on your face, it can increase temperature and promotes internal blood circulation while free oxygen has strong penetrating power which can increase the oxygen content of the blood after its access into the skin, which will be conducive to nourishing the skin and deep tissues. Steam can soften the upper layer of skin and makes it easier to remove dead skin cells so as to create a favorable condition for further desquamation. It is both convenient and economical to use as the sprayer is composed by steam generator which includes beaker and electrical element with its principle similar to electric kettle. The electric heating element inside the beaker will produce heat energy by current. The temperature of the water inside the beaker will rise gradually until boiling and generating steam, which will spray out misty gas from the spout of the steam pipe to form mist spray.It is also furnished with aroma spray head, in which you can add different essential oil according to the need of the skin so that it can give you the best skin care. Explore the entire range of Acne Removal available on Nykaa. Shop more Kingdom products here.You can browse through the complete world of Kingdom Acne Removal .